I met up with Kala and Jim from Kentucky around 730 in the morning. It was a good morning for doing some inshore charter fishing inshore Amelia Island. We headed out of the Fernandina Beach Marina to our first spot of the day. I set them up with floating corks rigged with 1/0 Kahle hooks. The bait was a live mud minnow. The corks were set between two and four feet deep. I instructed Kala and Jim to cast their baits up current and a few feet from the grass. The plan was to have the corks drift with the tide and cover as much area as possible. It was not long before Kala’s cork was under the water. I told her to let it be for a few minutes and let the fish work on the bait awhile. The cork would pop back up and then go back down. After a few times of the fish doing this, the corks stayed under the water. Kala got the slack out of the line and set the hook. Immediately the fish started fighting and the rod was bent over. I told Kala to keep the line tight and slowly work the fish close to the boat. I got the net under the fish and into the boat. The first thing Jim and Kala said was what in the world is that fish. I told them that this was a flounder and a nice 17 inch one at that. They stated that they had never seen one before. Being from Kentucky I can understand that. I told them that they were really good to eat and that we should be able to catch a few more today. Jim was able to hook one next and brought another keeper to the net. They were both getting the hang of this. The action stayed pretty steady with a couple small trout and Redfish being caught too. We went to another area and fished the grass shoreline picking up a few more keepers and some smaller ones being released. We headed back to the marina and I cleaned and packaged the fish destined for the dinner table. I had a great time charter fishing inshore Amelia Island with Kala and Jim today. 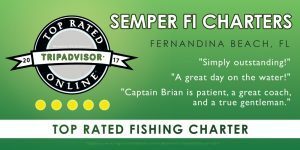 We are Northeast Florida's Premier Inshore Fishing Charter located on Amelia Island. 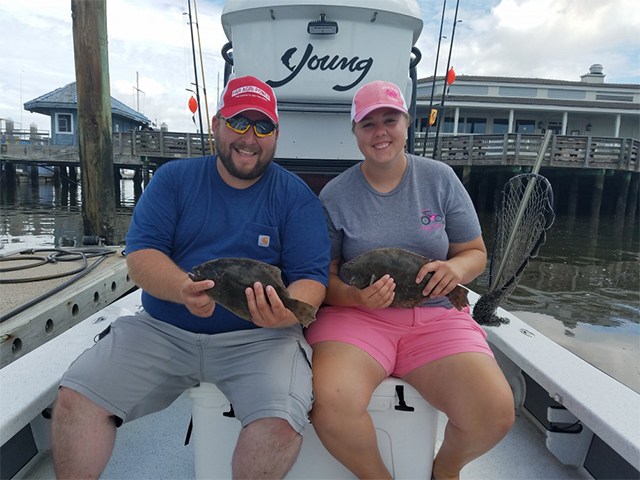 You will love our wide variety of Amelia Island inshore fishing charters including deep and shallow water, rock piles, near shore rocks, various sand bars, grass flats and more. Book today! Conveniently located two hours from Orlando, Disney World and Sea World, so you can plan a fishing charter along with your vacation.